Iron Men is out on DVD on 6th March and to celebrate we have a great competition for you and 3 copies of the DVD to give away. As the 2015/16 football season drew to a close West Ham United bade farewell to its sacred Boleyn Ground after 112 years of occupation and moved, lock, stock and barrel, to the London Stadium up the road; a momentous relocation that has been recorded with the gravitas and passion it deserves in documentary film IRON MEN. 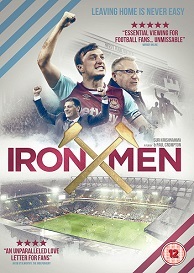 IRON MEN tells the story of this tumultuous and historical transfer through the voices of club captain and local boy Mark Noble, the manager Slaven Bilic, Hollywood actor Ray Winstone, the owners David Gold, David Sullivan and Karren Brady, the local traders and most importantly, through the fans on the terraces; the people who have stuck by the club through thick and thin and cemented a community together for more than a century. Which Football team is this DVD about?